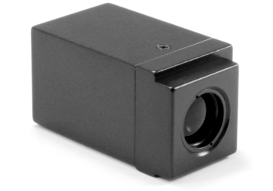 All Micro-Radian autocollimators are available with analog-only electronics and analog outputs. These autocollimators are suitable for providing high speed measurement data in analog servo-feedback and servo-feedforward systems. Both Micro-Radian analog autocollimators and digital PC-based autocollimators are ideal for OEM airborne and stable platform applications. As always, all of our products can be customized to fit your specific application. The maximum angular range is the maximum calibrated measurement range of an instrument. The analog outputs of all Micro-Radian analog autocollimators are calibrated to read ±10 volts for ±angular range. The maximum working distance is the maximum recommended distance between the forward-most point of the autocollimator and the target reflector. Operation at the maximum working distance will limit the angular range to less than the maximum angular range. Analog autocollimators have a low-pass filter for both azimuth and elevation outputs. The filter frequency listed in the table is the standard cut off frequency; however, any cut off frequency can be selected up to 25 kHz. Accuracy is the correlation of the autocollimator readings to a known standard and is given as a percentage of the angular range (full scale). The standard connector for an analog autocollimator is a micro-D 15pin (uD-15). Azimuth and elevation data is provided as analog voltages corresponding to angle. The scale for all models is ±10 volts for ±angular range. The specifications listed in the table above can be modified to fit your specific application. In addition to these requirements, Micro-Radian is also capable of electrically isolating the body of the autocollimator from the circuit, and conformal coating the circuit board and components. If you have other needs, or questions about any of our autocollimators please contact us.